The Karizma-ZMR is an update of Hero Honda’s premium bike Karizma with all new looks and feel.This Karizma-ZMR come wth all new stylings and improved sporty looks.The headlamps are huge but fits in the body. The rear has been completely redesigned is a bit like CBZ Xtreme’s, although sleeker. 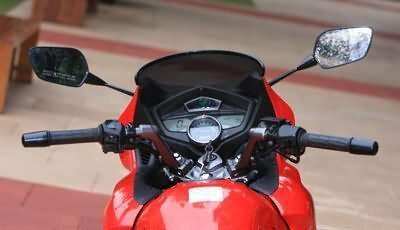 The tail lamp gets a pentagonal arrangement of LEDs and is flanked by clear lens blinkers. The Xtreme-like split grabrail is quite convenient for pillions to grab as well as strapping on some serious luggage. The Karizma ZMR comes full digital instrumentation, with a round LCD bar central tachometer and big readouts for speedo and odo/trip meter on either side.It also features an interesting dual color illumination , the tacho is lit in white while the rest get an orange back light. There is scrolling welcome message when you start the ignition.The regular tell tale affair is nestled on top and there is a clock and an instantaneous mileage indicator . The switchgear remains the same and, in true Hero Honda fashion, there is no engine kill switch. Another change is gas-charged shock absorbers with bright red springs at the rear. The ZMR also sports a disc brake at the rear. 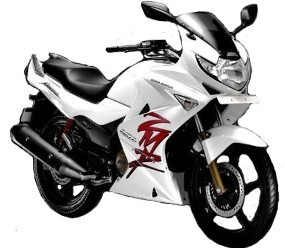 The Karizma ZMR come in Pearl White, Sports Red, Vibrant Blue, Moon Yellow & Panther Black colors. Top Speed:	126kph , 0 to 60 Km/h in 3.70 sec.